10 Best Electric Pressure Cookers 2019 | Happy Chef, Happy Tummy! 3 How Did We pick? 5.12 #12. Non-Stick, No thanks! 6.1 What is Pressure Cooking? 6.2 How Do Pressure Cookers Work? 6.8.1 #1 Electric or Stovetop? 6.8.2 #2 What Size Do You Need? 6.8.3 #3 What Material Is Suitable For a Pressure Cooker? 6.8.4 #4 How Do I Clean a Pressure Cooker? 6.8.5 #5 Is Pressure Cooking Safe? 8.1 How do I know when the pressure cooker is operating correctly? 8.2 If I use high heat will the food cook faster? 8.3 Why does steam escape from the overpressure valve at the beginning of the operation? 8.4 When should I change the rubber gasket? 8.5 What should I do if, during cooking, steam stops coming out of the vent tube? 8.6 What makes the rubber gasket stretch, shrink, swell or stiffen? 8.7 When cooling my pressure cooker under the water tap, it whistles; is this dangerous? 8.8 Can you use an electric pressure cooker for canning? 8.9 Are pressure cookers safe to use? 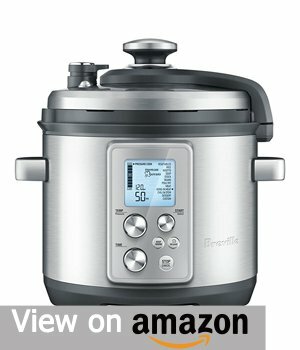 8.10 Which is better stainless steel or aluminum pressure cooker? 8.11 What makes the cooker lid hard to close? 8.12 Why won’t my pressure cooker come up to pressure? 8.13 Can I use my pressure cooker on a flat top (glass or ceramic) range? If you are constantly short on time and are looking for an easy and fast way to prepare healthy, homemade meals, you need to get yourself a pressure cooker. Investing in a good pressure cooker and sparing a few minutes to prepare food will is the right step towards healthy eating and lifestyle. Luckily for you, this buying guide and review will help you find the best electric pressure cooker that suits your needs. Read on to get more insight on pressure cookers. Here is the best electric cookers recommendation. The IP-DUO80 has a lot going for it in terms of features, and as a result, it is the first on our list. For starters, it is a multi-purpose pressure cooker with up to seven programmable settings that allow the user to cook various foods at ease. In regards to looks, there is nothing special to note aside from the fact that it strongly resembles an electric rice cooker. The IP-DUO80 features a durable stainless steel exterior and interior that aid in its functionality while also make it appealing to look at. Touching more on the design, the IP-DUO80 features an elegant but functional design that allows the users easy access to clean. What’s more, this pressure cooker features a control panel with a large display screen and large buttons that are intuitive to use especially with the preprogrammed cook settings. The IP-DUO80 has not missed any trick when it comes to safety. It features a comprehensive list of safety mechanisms that cannot be exhausted in this short review. The standout safety feature on this pressure cooker is the third generation microprocessor. This microprocessor is the latest technology used to monitor and regulate pressure, temperature and time in the cooker for efficient cooking. Since the features of the IP-DUO80 are inexhaustible, we saw it fit only to mention the most significant features. When all things are considered, this pressure cooker provides everything anybody could ever need in a pressure cooker. It is easy to see why it is the best according to our professional opinion because whether it is safety, price, usability or versatility you are after, the IP-DUO80 provides. For all their similarities, the IP-DUO60 is a smaller brother to the IP-DUO80 model. These two models are from the same brand, and naturally, they share many similarities with the major difference being size. The IP-DUO80 has a capacity of eight quarts while the IP-DUO60 has a much smaller capacity of six quarts. Both models are versatile and provide multi-functional purpose such that you can prepare different categories of food in one single appliance. Some of these functions include slow cooking, steaming, rice cooking, yogurt making, warming, etc. Just to touch on the design and build material of this pressure cooker. The IP-DUO60 simplistic design is covered in stainless steel interior and exterior. The brushed stainless steel interior ensures an absence of chemical coatings that react with acidic foodstuffs when exposed to extreme pressure and heat. Looking at the features of this pressure cooker, it is easy to see why it is a high-end cooker. With three different temperature settings and two different pressure settings, you can prepare just about every meal you put your mind to. On top of everything, this pressure cooker is dishwasher safe. Most critics would agree with us when we say that the IP-DUO60 has matched the high expectations that come with the Instant Pot brand. Technology-wise, the IP-DUO60 features cutting-edge technology that propels it ahead of the curve and the durability to give you service for years to come. While the bigger brother, the IP-DUO80 is suitable for everyone, this IP-DUO60 is ideal for small to medium-sized families thanks to its modest six-quart capacity. The Breville model number BPR700BSS matches both the Instant Pot models featured above in regards to features and utility. Like the Instant Pot models above, the BPR700BSS pressure cooker features the latest groundbreaking technology that has propelled it in the top three list. However, when it comes to size, the BPR700BSS features a more conservative capacity of six quarts rather than a full-sized 8-quarts capacity. The modest size of this pressure cooker makes it suitable for small and medium-sized families. Technology-wise, this breville has all the bells and whistles you could ever need in a pressure cooker. A good example of this is the dual sensors fitted at opposite ends of the cooker (top and bottom) that help get more accurate readings of the pressure and temperature. Once accurate readings have been recorded, the sensors automatically regulate the settings accordingly to achieve the best results. An automatic steam release mechanism works in conjunction with the sensors to release excess steam when the pressure build-up reaches dangerous levels. The fact that the Breville BPR700BSS comes the closest to matching the Instant Pot models is a great achievement by itself. Since pressure cookers from Instant Pot are considered the crème de la crème of pressure cookers, you wouldn’t be out of line to speak of the Breville BPR700BSS in the same light. For all its greatness, the biggest blemish of this pressure cooker is that you will feel the cost of burning a hole in your pocket when you purchase it. For this reason, alone it didn’t make the top two. So if the price is not an issue for you, I would strongly recommend this Breville BPR700BSS, but if you are looking for a bargain buy, you are better suited looking at one of Instant Pot’s IP-DUO model line. Next, we look at the Cosori pressure cooker. This particular model under review is the 2019 model meaning it is the latest model and features all the latest technology. 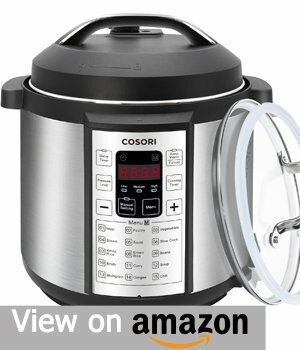 Just like the cookers that ranked above it on our list, this 2019 Cosori is a multi-functional pressure cooker that has up to seven different functions. With a capacity of six quarts, it is needless to say the Cosori is suitable for medium sized families. As for the safety features, Cosori is ahead of the curve with groundbreaking features such as pressure guards, pressure and thermal limiters, electrical monitors and others. The best thing about Cosori is that it has stayed true to the vision of pressure cookers, which is making cooking easier and faster. With 15 cooking modes at the tip of your fingertips, cooking foodstuff such as vegetables, meat, rice, beans, etc. has never been easier. The engineering team at Cosori took a safety approach first when manufacturing Cosori pressure cooker. The consequence of this approach is that every component of this pressure cooker has been designed with safety in mind. That being said, safety is just one of the many dimensions of the 2019 Cosori. Another dimension of the Cosori pressure cooker is versatility and utility. With this model, one can do various kitchen jobs such as sterilizing, steaming, heating, etc. and at the best part of it all is that you can cook 15 of the basic dishes at the touch of a button. 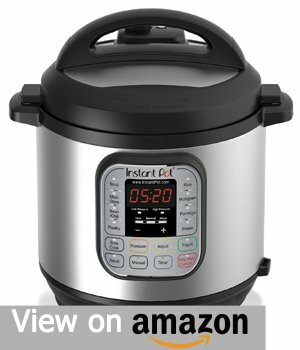 The IP is yet another pressure cooker from the Instant Pop brand. With the IP-DUO model line being more consumer-oriented with its high level of utility, this IP model is a little different, offering technology in place of utility. The main talking point of the IP pressure cooker is its Bluetooth-enabled system. This system allows you to connect your smartphone or tablet to the pressure cooker for monitoring and encoding commands on the cooker remotely. The Bluetooth connectivity and the free iOS app (Android app coming soon) that control the IP pressure cooker have brought rise to remote cooking. This can be achieved by simply loading all your favorite recipes on your smart device and executing the cook orders to the IP cooker wirelessly from wherever you are. It is no secret that technology divides people’s opinion right in the middle. With that said, some people will love the Bluetooth feature on the IP while others will flag it as a gimmick and fail to find a use for it. We conducted a survey on what people thought about Bluetooth on a pressure cooker. Most people lauded the idea but later logically claimed it was an idea ahead of its time. So whatever side you fall on this argument, it is worth reminding you that the IP is more than just a Bluetooth enabled pressure cooker. However, the Bluetooth feature is still the stand out feature so if you cannot see past it; there are two courses of action to take. Buy the IP pressure cooker if you think you will find a use for the Bluetooth feature and don’t mind paying a little extra for it. At the same time refrain from buying this IP if you don’t want to spend extra on the Bluetooth feature yet you don’t see yourself ever using it. There are other alternatives. The Power Pressure Cooker XL is the large model of this class of pressure cooker and features an eight-quart capacity. For its price, the Power Pressure XL features all the standard features you’d expect in its class such as a slow cooker, preprogrammed cook buttons, and an automatic warming feature. One neat feature fitted in the XL cooker is power cooking. This method of cooking essentially involves trapping nutrients and vitamins in food when cooking. Cooking meat using this method helps infuse flavor into the meat without using fats and oils while vegetables are softened while keeping the nutritious fibers intact. When evaluating the Power Pressure Cooker XL, you will not find any special or unexpected surprises. While some people may see it as a bad thing, I couldn’t disagree more with them. As far as superpowers for pressure cookers go, the flatness of this model is its superpower. The Power Pressure Cooker XL guarantees reliability and durability without any unwelcome surprises down the road. It is for this reason alone that I would recommend it to anyone in the market for a reliable pressure cooker. The EPC-808 model from Elite Platinum is a stainless steel build pressure cooker that features an extra-large capacity of eight quarts. The stainless steel layer is brushed and features a non-stick interior while the large eight-quart capacity is ideal for preparing a meal for a mid-sized family. This unit is surprisingly cheap but comes with all the bells and whistles you’d expect from a high-end pressure cooker. For starters, the EPC-808 comes equipped with multi-function ability. This feature combined with the baskets allow you to cook various foods at the same time to save time and energy. You no longer have to worry about experiencing a power outage whenever you’re cooking. The EPC-808 features an automatic resumption mechanism that resumes cooking whenever the power is restored to seem as if the power hadn’t been tampered with. Regarding features, there is not much to say about the EPC-808 since they are pretty standard. The most appealing attributes about the EPC-808are the design and price. From all the pressure cookers we tested, the EPC-808 is by far the best looking among the lot. When it comes to price, very few pressure cookers can offer the same beautiful design and features for such a low price. The CPC-600 is just one model among the broad range of pressure cooker models under the Cuisinart brand. This Chinese brand has built a reputation in the pressure cooker market around the globe for making high-quality cookers that consumers can rely on. Take the Cuisinart CPC-600 for example, it is made from high strength stainless steel and uses 1000 Watts of electricity. These two factors mean that the CPC-600 is durable and powerful enough to cook meals in a shortened time frame. This pressure cooker features cool-to-the-touch handles even when operational. Since the CPC-600 is dishwasher ready, it can be cleaned effortlessly right after cooking. After mentioning all these features, the best part about the CPC-600 is the wide range of customizable options. From the temperature to the time, to the pressure, all these features can be adjusted by the mere touch of a button. The Cuisinart CPC 600 pressure cooker is one of those rare products that are the perfect combination of a couple of factors to make them perfect for consumers. 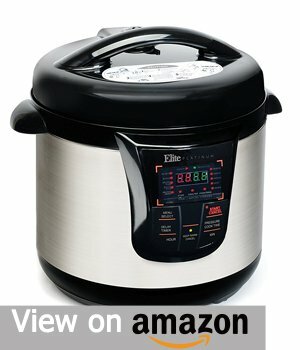 This pressure cooker is truly a consumer’s product, and so I would recommend it to anyone. 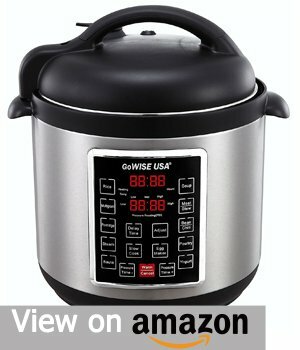 The GoWISE GW22620 is the fourth generation of GoWISE pressure cookers. This model has grown popular over the years for being a multi-functional and programmable pressure cooker. Being the fourth and latest generation of GoWISE, the GW22620 features the latest gadgets in the market. The best part is that this pressure cooker can be purchased at a moderate price. As for the design and outer build, the GW22620 is made entirely from high strength stainless steel. This stainless steel outer body is part of the many components that make up the entire unit. Physical components such as the sensors, gasket lid, outer handles, and the control panel work seamlessly with preprogrammed settings in the cooker to form one cohesive cooker. If you want an excellent pressure cooker that is easy to use, very well made and highly affordable, look no further than the GoWISEGW22620. This cooker is ideal for people that are on a budget and want a great deal for their money. The Aicok is a multi-functional pressure cooker that is equipped to prepare different types of food with just a few tweaks on the settings. Apart from cooking different foods, the Aicok can be used to perform different functions such as steaming, sterilizing, warming, slow cooking, etc. with just a few tweaks to the temperature and pressure settings, you can cut down on cooking time by up to 70% thereby saving time and energy. The Aicok comes equipped with smart programs that perform various functions. A great example of one function is the automatic pressure release mechanism that releases steam when the pressure inside the cooker gets to a dangerous level. Another example of an automatic feature is the Aicok’s 24-hour delay timer that allows the user to program the cooker to start cooking at a later time. An interesting fact about Aicok is that their pressure cookers are made by the same company as IP. It is no secret that IP is highly regarded in the world of pressure cookers. Since Aicok cookers share the same manufacturer as IP, it means they are just as high quality but at a discounted price. Picking the best electric cooker is not an easy task. We considered many factors such as price, user reviews from websites and the last and most important thing we considered is the user experience we got from our rigorous tests. Since we cannot review all the pressure cookers, we started with the elimination process and were left with ten of what we considered to be the best cookers on the market. We tested all the cookers with two distinct food types (rice and meat) of the same quantity. While the end results were more or less the same, we discovered a few things along the way. The first discovery is that pressure cookers save a lot of time when cooking and are easy to operate with stovetop cookers requiring a little bit more of a hands-on approach. The second discovery is that if you are a busy person around the house with chores, an electric cooker is best suited for you. This is because, you can set the temperature, pressure and time of cooking then you are free to resume your other house chores. The test we carried out involved many brands and models of pressure cookers. All the models we tested were equally impressive as they produced more or less the same results. However, there can only be one winner, and that winner was picked based on merit, without any prejudice. 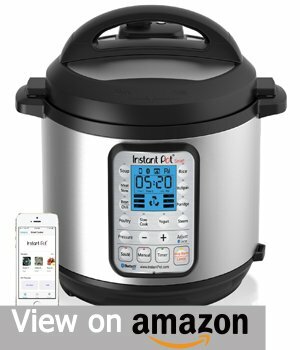 We’re glad to announce the Instant Pot IP-DUO80 as our clear winner. Among all the special pressure cookers we tested, the IP-DUO80 shone brightest and ticked all the boxes. With that said, buying this pressure cooker will guarantee your happiness. Pressure cookers run very hotly, and therefore they build an extreme amount of pressure when generating steam. If this pressure is not contained in a safe environment, an explosion may occur in the kitchen. There can never be too many safety features when it comes to cooking with pressure cookers. To prevent these destructive explosions, ensure your pressure cooker comes with the standard safety features such as tightly secured lid locks, effective release valves, and visual pressure indicators. Weighted Valve Pressure Regulators: Also referred to as a jiggle top because it jiggles to a gentle rhythm when cooking begins. Some pressure escapes when this regulator starts jiggling, and that helps regulate the pressure building up in the pressure cooker. The jiggle top is removable for easy cleaning. For best cooking results, the regulator should only be used when the vent openings are clear, not when they are blocked. Whenever the jiggle top stops rocking about when cooking, it is a clear indication that something is not right and therefore should be checked. When it comes to price, the weighted valve regulators are modestly priced than the other two. Modified Weighted Valve Pressure Regulators: Like the name suggests on this pressure regulator, it has a modified design that attaches to the pressure cooker. The modified regulator maintains a pressure level of 15 PSI which is ideal for cooking. But while the pressure is released in small bursts, there is no clear indication to notify the user the exact time the steam will be released. Therefore, it is always advisable to remain cautious when using this regulator design to avert steam injuries. In regards to the price, this modified pressure regulator cost more than the weighted valve regulators but are still priced modestly. Spring Valve Pressure Regulator: This spring valve regulator uses a one-inch pop-up valve that indicates the pressure in the cooker. Most spring valve regulators allow you to adjust the internal pressure of either 10 PSI or 15 PSI for faster cooking. This can be done by simply adjusting the stove top temperature. Unlike the other two pressure regulators, the spring regulator operates quietly without any drama, so it is advisable to monitor it frequently. Also, this spring valve regulator costs considerably more than the other two pressure regulators. Since there are many manufacturers of pressure cookers, it is always advisable to pick a reputable brand that has been operational for many years and one that is financially stable. Brands that have been in operation for many years have better expertise in manufacturing pressure cookers. Also, there is a better chance that these reputable brands will be on the market for a longer period in case you need to get replacement parts. Buying from a reputable retailer (whether online or otherwise) is just as important as picking a reputable brand. Since reputable retailers only sell authentic products, you are shielded from buying knock-off products that have otherwise saturated the market. Also, most reputable retailers sell replacement parts in case you might need them over time. A cover interlock system is an essential safety mechanism that automatically locks the pressure cooker’s cover when the pressure is high to avoid injuries from steam. This safety mechanism prevents the pressure cooker from building up pressure when the cover is not secured in place correctly. The interlock system automatically unlocks when the pressure has been reduced to a safe level. Handles are an important part of the pressure cookers. While some people may not pay much attention to them when buying a pressure cooker, they are vital in carrying the pot when filled with food. It is, therefore, important to check the quality and durability of the handles to make sure they serve you for a long time. Also, ensure that the handles feel comfortable in your hands especially when the cooking pot is full. Another aspect you should look at is heat resistance. The handles should be able to resist the immense heat they are exposed to when the pressure cooker is in use. Cooking baskets and racks are used to separate different foods so that they don’t mix in the cooker. Without these two cooking tools, the food in the cookers would get mixed. Apart from acting as food separators, they help conserve energy since users can cook different foods at one go. Some pressure cookers come with non-stick interior materials which are known for being poor at handling intense pressure. Therefore ensure the interior is made from the same material as the exterior, which in most cases is either aluminum or stainless steel. Bi-metal or tri-metal base are suitable for pressure cookers since they are the best heat conductors, they don’t scorch and are the easiest to clean. Most models that have bi-metal or tri-metal bases feature an aluminum coat/layer that distributes heat evenly across the entire pot to prevent scorching. If you own a stovetop pressure cooker, you should consider the compatibility of your kitchen’s cooktop. This is because some stovetop cookers may not be suitable for wooden table tops or ceramic table tops when hot. Since these types of cookers rely on an external source of heat, they remain hot on the exterior, and that heat may cause damage to ceramic surfaces or wooden surfaces. However, if you own an electric cooker, this cooktop factor should not bother you since these types of cookers rely on an internal source of heat. This means the heat is generated from within and is contained in the cooker all thanks to the insulation fitted at the bottom of the cookers. This insulation allows you to place the cookers on any cooktop without risking damage. When buying a pressure cooker for the first time, it may be a little intimidating to use it, and that is why the most reputable brands provide a recipe booklet and instructional booklet with the pressure cooker. Needless to say, the instructional booklet provides a guide on how to use the pressure cooker safely and effectively while the recipe booklet provides basic recipes to get you started. The reason why the cost factor has been featured last is to emphasize on its triviality. While we cannot deny that the price plays a huge role, the tipping points of buying a pressure cooker should primarily lie in safety and ease of use. Getting a low priced cooker is not necessarily getting a good deal since the low-priced cooker you end up buying may lack essential features that you need. Non-stick surfaces are great for kitchen utensils such as pans but not great for pressure cookers. This is because pressure cookers are exposed to heat and extreme pressure for longer periods, and this causes the non-stick surfaces to degrade and peel off. Above all, pressure indicators allow you to gauge the pressure in the cooker accurately. With a pressure indicator, you can effectively control the pressure level not only for safety reasons but also for cooking food at the correct pressure level. A quick release valve lets the user release pressure in the pot while maintaining the heat. Once the pressure has dissipated, the lid can be opened safely. Cooking programs are more electric cooker territory than stovetop cookers. This is because most electric cookers come preset with cooking programs. This is an extremely helpful feature because at the touch of a button you can select the meal type you want to prepare (whether fish, beans, rice, chicken, etc.). Cleaning anything by hand can be tedious, and this rule applies to pressure cookers. This is true especially in some models than others, and that is why you should buy a pressure cooker that is dishwasher safe to save you the hassle of hand washing. The best pressure cookers offer a range of pressure settings. Most pressure cookers offer a variety of pressure settings with the most common being 5, 10, and 15 PSI with more advanced cookers offer more settings than that. With more pressure settings on your cooker, the more options you will have. However, it is worth to note that most recipes require a pressure setting of 15 PSI. It is a method of cooking food in an enclosed pot that is tightly sealed to build pressure which in turn cooks food faster and more wholly. Since this method of cooking uses bases such as water, the food being cooked retains all its vital minerals, vitamins, and nutrients. As food cooks in the pressure pots, steam is produced and builds up as the temperature builds up. When the meal is ready, the pressure inside is released slowly to allow the user to open the lid safely. Pressure cookers have been in use for decades, and the first ever made pressure cooker model and the most current, up-to-date model use the same basic principle in cooking. These kitchen appliances are fitted with air-tight lids that trap air while cooking. This causes the air to expand exponentially, therefore, raising the boiling point of water to as high as 250 degrees Fahrenheit. Raising the boiling point of water, in turn, decreases the cooking time of food by up to 70% at normal elevation. However, when the pressure reaches potentially dangerous levels, it is automatically released by the pressure release valve usually located at the top to prevent accidents. When cooking with a pressure cooker, at some point, you will need to release the internal pressure to get access to the food. Luckily, there are many ways to release the pressure from your cooker. The fasted way to release pressure is by dipping the pressure cooker into a pan of cold water or running water. The most natural way is to remove the pressure cooker from the heat source or just switch the heat source off and let the cooker cool down by itself. As the pioneer pressure cooker version, the stovetop has evolved over the years. The many changes the stovetop pressure cooker has undergone over the years have been geared towards meeting the needs of the consumers. While one could argue that the evolution of these cookers has made them better with time, the stovetop pressure cookers are not without faults. With this in mind, let us look at the strengths and weaknesses of these pressure cooker version below. Cooking with the stovetop cooker is faster than cooking with an electric cooker. On average it takes about 11 minutes with the stovetop while it takes about 14 minutes with an electric cooker. Gives you three options for releasing pressure. You can opt for the fast cold water dipping method which releases pressure in under a minute. One could also detach the pressure valve knob to release the pressure in about two minutes or remove it from the heat source to naturally release the pressure in about 10 minutes. With versatility, practicality, and durability, it is easy to see why stovetop pressure cookers made of stainless steel are highly rated across the globe. The only blemish when it comes to this type of pressure cooker is that it does not feature a timer for scheduling meals. However, when all things are considered, one can easily forgive this minor drawback especially if you are a shrewd cook who doesn’t need time schedules to cook. It should come as no surprise to learn that pressure cookers were introduced to the market long after stovetop pressure cookers had been in use. Just like stovetop pressure cookers, the electric cookers have evolved over time. With a mere touch of a button, you now have the ability to adjust the multiple settings such as time, temperature, and pressure featured on these electric cookers. These cookers normally have small display screens that display vital information about the cooker such as temperature, pressure, etc. Here are some pros and cons of electric cookers. Ideal for cooking preserved foodstuff, especially canned food. Since the time, temperature and pressure are controlled automatically; you don’t have to go through the hassle of manually controlling them. Most electric cookers come with various pressure settings such as ‘high,’ ‘low,’ ‘rice,’ ‘meat,’ and so on. This simplifies the cooking process. Some models feature a preset timer where you can set up your food in the cooker in the morning as you leave the house and delay the cooking for up to 11 hours. This feature comes in handy such that when you get home from work, you can find your meal ready. When all things are considered, it would not be a stretch to claim that the pros outweigh the cons with the electric cookers. Sure, these cookers are a bit bulkier and cannot be dipped in cold water but with so many automated settings, your input is considerably less, and that in itself makes them worthwhile. Save Time: Because pressure cookers trap a lot of heat and pressure, they take approximately up to 70% less time to cook compared to regular pots. Your Safety: Modern pressure cookers are fitted with pressure sensing mechanisms that sense when there is an excess buildup of pressure and let it escape to prevent accidents. Also, most pressure cookers have heat resistant handles that allow you to carry the food without burning your hands. Flavor of food: Pressure cookers not only preserve the nutritional value of your food but they help preserve the physical appeal (texture and color) of food. Saves Space: Nowadays pressure cookers serve many cooking functions, therefore, one can get rid of appliances such as rice cookers and slow cookers, etc. Easy and Convenient: Cleaning is easy. Cooking is faster and more efficient. Digital controls on pressure cookers make life easier. Lastly, some models feature an auto-warming feature that keeps your meal warm till you are ready to serve. The lid on a pressure cooker is, without a doubt, the most delicate component of a pressure cooker. The lid carries the sealing gasket that prevents pressure from escaping while cooking. This gasket should be removed after cooking, cleaned and attached once it has dried. And since this rubber gasket is delicate, it should be cleaned by soft materials that won’t puncture it. A punctured gasket will leak pressure thereby making the cooker less effective. It is worth noting that no matter how much you care for the gasket, it will eventually wear out and will need replacement. This is normal for all pressure cookers. When you notice your pressure cooker taking longer to build pressure leading to delayed cooking times, it is probably the best time to replace the gasket. The good news is that these gaskets are readily available in both online stores and related retail stores. Nowadays people weigh the pros and cons of cooking versus ordering in and more often than not, ordering in seems like the logical reason. While cooking for yourself guarantees you a tastier, healthier meal, most people consider it a time-consuming hassle. However, pressure cookers reduce the cooking time by up to 70%, so there is every reason to prepare yourself a more fulfilling homemade meal. Here are some basic things you need to know before getting yourself a pressure cooker. Both of these pressure cooker variants have their merits and shortcomings, so when choosing a cooker, you should consider the strengths and weaknesses of both variants and decide which will suit your needs best. #2 What Size Do You Need? There are two sizes of pressure cookers, with the first being home-based cookers while the second being industrial based. For home-based pressure cookers, the sizes further vary from two quartz to eight quarts and can easily be stored in standard-sized kitchen cabinets when not in use. A two-quarts-sized pressure cooker is suitable for single people while a cooker with an approximate six to eight quarts capacity is suitable for mid-sized families. #3 What Material Is Suitable For a Pressure Cooker? Pressure cookers are primarily made of either stainless steel or aluminum. Both materials have advantages and disadvantages. For stainless steel, it heavy thereby providing much more even heat distribution across the cooker and is less reactive to foods. What’s more, a stainless steel cooker is more durable. The downside is heaviness and high price. For aluminum, it is light and more affordable than a stainless-steel-made pressure cooker. The flip side is that it is less durable and there is a chance that cooking acidic foods at high temperature and pressure level may provoke a chemical reaction with the aluminum sheet. #4 How Do I Clean a Pressure Cooker? The main components of a pressure cooker are the pot and lid. They can both be hand washed while some models come with dishwasher safe components. For detailed cleaning instructions regarding your exact model, kindly refer to your cooker’s user manual to be sure. 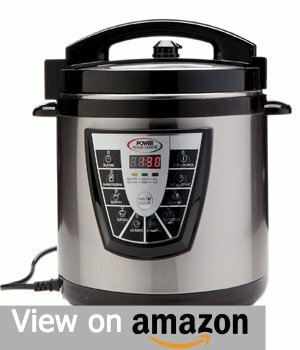 #5 Is Pressure Cooking Safe? Before pressure cookers are introduced to the market, they have to meet the safety standards set by respective safety bodies. Since the pressure produced in these cookers can potentially cause an explosion, one of the standard safety features fitted in all pressure cookers is a pressure release valve. Another safety features you should look out for in a pressure cooker is an automatic locking lid. But to be safe, read the user manual and always exercise caution when operating a pressure cooker. 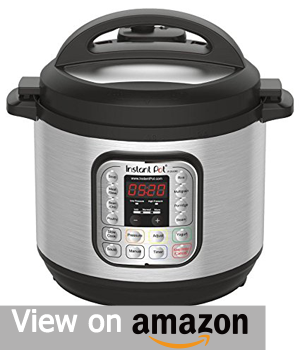 Instant Pot is without a doubt one of the most popular brands of pressure cookers. This Canadian-made cooker has some legendary units including the IPDUO80 and the IPDUO60 which are named as first and second on this review. Electric-Powered cookers are not known for their ability to sear meat, but Instant Pot makes models that are powerful enough to handle that job. The Breville brand is a close second to Instant Pot and offers a great alternative. Despite being a popular brand for making reliable pressure cookers, all Breville pressure cooker models are moderately priced. This has made them more popular among consumers who want the best features in a cooker at affordable prices. When it comes to the utility factor in pressure cookers, look no further than the GoWise brand. GoWise pressure cookers are probably the most technologically advanced pressure cookers on the market today. But despite being more advanced than other brands, customers have remained loyal to GoWise for their simple and intuitive user interface. The Cuisinart brand produces among the best pressure cookers on the market. It is no coincidence that the reviews have nothing but positive remarks about these cookers. Apart from the Cuisinart CPC-600 (number 8 on our list and the best Cuisinart in our opinion), the Cuisinart brand has many pressure cooking models. The different models have different designs, and features, therefore, vary in price. While the Cosori brand is not as well-known and established as brands like Breville and Instant Pot, their pressure cookers are true of a world-class quality. Just like the Cosori model featured in number four above, most Cosori models feature a simplistic design that simplifies their usability. 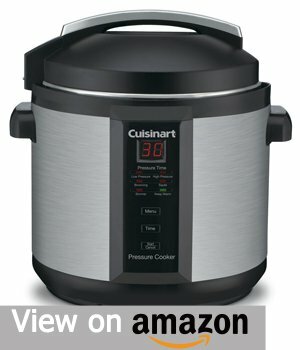 Costco is a pressure cooker manufacturing company that has built a solid reputation for producing high-quality pressure cookers for at reasonable prices. Take the entry level Costco models for example. They are competitively priced yet are still fitted with all the latest technology available on the market. 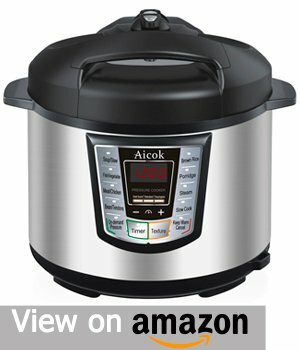 Not many pressure cooker brands can claim to boast as many positive reviews as Aicok. The reviews are a clear indication that Aicok customers are satisfied with the pressure cookers. Take the 7-in-1 Aicok pressure cooker that listed as number 10 on our list. It is a perfect example of a well-rounded pressure cooker that has all the desirable features in a modern pressure cooker. How do I know when the pressure cooker is operating correctly? A tightly closed lid and a jiggling pressure valve when in use are the best indications that the pressure cooker is operating correctly. If I use high heat will the food cook faster? The short answer is no. High heat should only be used in the initial stage when building pressure otherwise high heat will not cook food faster. Rather, it is a waste of energy and accelerates the loss of water which may result in poorly cooked food. Why does steam escape from the overpressure valve at the beginning of the operation? Steam escaping at the beginning of cooking is completely normal so don’t be alarmed when it happens. The steam that escapes gets rid of the cold that is in the cooker just before cooking starts. Once cooking has been going on for a while, steam should not escape. When should I change the rubber gasket? The rubber gasket wears out over time, so when you notice steam leaking between the pan and the lid when everything is correctly in place, it is time to replace. It is always advisable to replace with a certified rubber gasket from the manufacturer for best results. What should I do if, during cooking, steam stops coming out of the vent tube? The first step should be to turn off the heat. When the cooker has cooled down, open it then remove the pressure control. Next, inspect the vent tube for clogging and clean it. Next, ensure the food and water level is at the right level. Once you do this, close the lid securely, insert the pressure control and finally resume cooking. What makes the rubber gasket stretch, shrink, swell or stiffen? The rubber gasket stretches when it has been exposed to grease and oils from food. To ensure the rubber gasket doesn’t stretch, clean the gasket thoroughly after each use. When the gasket stiffens or shrinks, it means the gasket has aged due to overexposure to heat and pressure. When cooling my pressure cooker under the water tap, it whistles; is this dangerous? The whistling is completely normal and not dangerous. It is a result of cold air entering the vacuum that’s left behind by the pressure reduction in the pot. Can you use an electric pressure cooker for canning? This is a non-settling debate which has no fix opinion. Some agree with this and some not. In my opinion, if you are using it for canning it needs more attention than Pressure Canners. But if you are not sure that you can handle the process please don’t pursue it. Of course, they are safe. Earlier it was not so, but today modern technologies are used in the manufacturing process which leads to ultimate features & design with high safety standards. In case of a stove-top pressure cooker, aluminum is mostly used as it is light in weight and a good conductor of heat. But for electric cookers stainless steel is used for sturdy build up. What makes the cooker lid hard to close? The cooker lid is often hard to close in brand new cookers. This is because the rubber gaskets in new cookers are dry and tightly fitted. Normally, this problem goes away after the first few uses. However, if this problem persists, you can lubricate the gasket with a small amount of cooking oil and use one hand to press down on the cover while you close the cooker with the other hand. Why won’t my pressure cooker come up to pressure? Can I use my pressure cooker on a flat top (glass or ceramic) range? No. It is not recommended since a large surface area of the cooker’s bottom will not be in contact with the heat source. Since the cooker’s bottom features a concave shape, heat transfer within the cooker will be minimum when placed on a flat top surface thereby preventing the buildup of pressure. Whatever your reason might be for investing in a pressure cooker, we hope you found our buying guide and review helpful. A lot of research and time has gone into it to make sure it provides a meaningful insight into pressure cookers. So whether you are looking to invest in one for the sake of eating healthy or just want one for its multi-functionality, remember that this is a long-term investment. Therefore it is vital not to rush the decision if you want to find the most suitable best electric cooker for your needs. Wow! Thanks for this complete line of great brands for pressure cookers! I have been planning to buy one, thank you for this great info. I am planning to duo plus 6 quart option. Can you let me know which one is better among Duo & Duo Plus? Duo plus is the improved version of the old duo from instant pot. So better to go with the latter. I am a little surprised because I thought that the IP duo plus would have been in the mix. So you think the Duo is better than the Duo Plus model? What exactly do you like better about the Duo? And then there is the Ultra models. I have been watching YouTube videos on pressure cookers and am trying to decide which one to get. The two at the top of my list were the IP Duo Plus 6 qt and the Cosori 6 qt. But I am starting to think about the Duo 6 qt. It just looks a little easier, and a lot of people seem to have it. The reason why we chose the IP Duo and not plus is the customer opinions. Plus is a refined version of earlier product but when we go by the consumer ratings Duo is clearly a winner. You can go by the either of two according to your choice. I started using pressure cooker years ago and have been obsessed with it since. I got this as a replacement to my old pot. Everything about this Cosori pressure cooker impressed me so far.